The day was May 8, 2015. 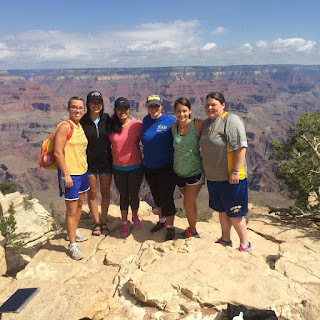 My community – Karen, Erin, Mary-Kate, Mariah, Kirsten – and I were on our way to Tusayan, Arizona, the town that sits right outside of Grand Canyon National Park. Way back in October, a time that now seems a hundred years ago, we had all signed up for the Grand Canyon Half Marathon. Out of the six of us, only two identified as runners. Even they had only run one other half marathon before. And that was in Page, Arizona, where the elevation is 2,000 feet lower than that of both Tusayan and our home of St. Michaels, Arizona on the Navajo Indian Reservation. This half marathon was going to be a challenge unlike anything we had ever faced before. As we sat in the van in our usual seats, Mariah and Kirsten in front, Erin and Mary-Kate in the middle, Karen and I cozy in the back, driving as we had driven many times before, that’s when it finally hit me – the sharp realization that I am going to have to say goodbye to my community soon. One of the reasons I chose to serve with Mercy Volunteer Corps was their emphasis on community living. Dedicating yourself to those in need is a big aspect of a year of service, but it’s important that you get something out of it as well. Community living gives you the opportunity to grow, empathize, live, and love with others. As the year winds down, I am sure that my time of service would not have been the same if I did not have my community. Volunteering for a year can be hard for people to understand. I’ve gotten many confused questions and comments about choosing to live out a year of service. We live in a world where everything we do has to have a clear and definite purpose, usually one that will benefit us in the future. We go to high school and get good grades that will get us into a good college. In college, we pursue a responsible major that will get us a job right away. We make money to buy a car, a house, have a family, a dog, go on vacations, and eventually save enough to retire. To perform a year of service is to go against the current. There is something sacred about living with other people who also chose not to glide down the river, but to push against its waters, trying to make a splash in places where other people may turn a blind eye. Two of us, Mariah and Mary-Kate, teach at St. Michael Indian School, a local Catholic school. The rest of us work at a special education school, St. Michaels Association for Special Education. Erin is a nurse, Kirsten is a teacher, Karen works in the therapy department, and I am in administration. Our community grew organically from the start. Each one of us brought something special to our home, whether it was a new way of thinking, a new dish for dinner, or simply a shoulder, or five, to lean on. There can be a lot of sadness on the reservation, which can be frustrating. We are making our own dents in the world through our service, but at the same time we know we can’t fix everything by ourselves. I’ve learned how important human relationships are. I am an introvert, yet I am constantly being drawn out of my room and into our community space, even if that means just sitting at the kitchen table with a couple of my roommates. If more people were open to wanting to create mutually happy and kind relationships, the world would change so much. We are all human beings, after all, living in the community of Earth. So, a day later, on May 9, 2015, my community and I were back in the van. 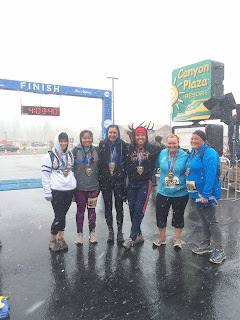 This time we were a lot more tired, a lot more sore, and now each of us donned a medal: Grand Canyon Half Marathon Finisher. We did it. Together. Saying goodbye to my community will perhaps be ever harder than running that half marathon. I’m sure we will keep in contact. We will text, we will email, and we will talk on the phone. We even have tentative plans to meet up once a year for a reunion. But nothing will ever be the same as living together as a community. When I think of my year of volunteer service, I will think of the vast Arizona sky, the numerous stars that light up the night, free to shine far from from city lights. I will think of the Navajo people and their beautiful ways of looking at the world, about how they walk their sacred land with such reverence and respect, how their spirituality is firmly engrained in their everyday lives. How they have suffered but still rise. I will think of carefully budgeting our stipends each month, planning meals, looking for deals. And I will think of my community: how six strangers became sisters in a matter of months. I am on my way to accepting that, in a few weeks, I will no longer be able to walk up the fifty stairs to our apartment and be greeted with a wave of laughter and warmth, but I know that we will always have Arizona.